An organ is a huge investment. Choosing the best instrument will lead to years of musical joy. The wrong choice will result in an unhappy and expensive experience. With advances in digital technology, and the prohibitive cost of pipe organs, the most chosen church organs today include digitally-produced pipe organ sound. Comparing digital organs can be daunting. By comparing organs’ sound quality, build quality and the commitment of the builder, this complex task is simplified. How Does It Compare to the Real Thing? – Every organ builder describes the merits of their technology, but the acid test for a digital organ’s sound quality is listening to a builder’s instrument that includes both real pipes and digital sounds and compare the two. If the builder can’t demonstrate this type of instrument, that is a red flag. If, in the comparison you can tell which sounds are real pipes and which are digital voices, you are not listening to state-of-the-art digital technology. How’s the “Sound of Silence”? – With organ music, the “space between the notes” is as important as the actual sound. The best digital organs use a process called convolution (sampled acoustics) that goes beyond old-fashioned digital reverb to produce the convincing acoustical ambiance of a cathedral or any reverberant environment. 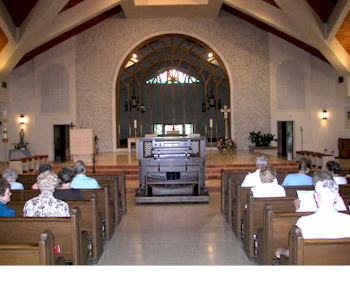 Even if your church has carpet and padded pews, your digital organ should sound like it’s playing in wonderful acoustics. What’s it look like on the inside? – That’s where you will see a builder’s commitment to quality. Do they skimp where they think no one will look? Are all of the interior wood surfaces finished? Is the console built like fine furniture or knock-down stuff from a discount store? Are all of the important electronics protected by metal enclosures? Are any heat-producing or high-voltage components bolted directly to wood? What keeps “visitors” from getting in? – Long after the last parishioner leaves on a Sunday morning the organ remains warm inside. It’s a nice haven for little critters, especially in the winter. And while they’re in there they can do nasty things. The easiest way into an organ console is through the expression pedal opening. Is there anything around the organ’s expression pedals to keep unwanted pests out? If so, is it made of metal or cardboard? Speaking of the Expression Shoe(s), what’s their construction? – The sturdiness of an expression shoe usually indicates the builder’s broader philosophy of building and you don’t even have to look inside the console to see them. Are they metal, wood or plastic? Do they feel firm and sturdy or do they just sort of flop around? How long have they been in business? “Standing the test of time” isn’t just a phrase. Nothing substitutes for experience. Have they developed their own digital technology or do they use someone else’s? Today’s digital organs can be marvels or mysteries. Will your builder be able to troubleshoot and support an instrument whose technology they haven’t even designed? Are they a real organ builder? A company that builds its own sub-assemblies has better quality control and offers longer product support. Some companies call themselves builders, but are really assemblers that outsource to cut costs. This methodology lowers quality and makes long-term serviceability questionable. Will they be there when you need them? A warranty is a good start, but how do you know the builder will be there to honor it? Make sure that the company has financial stability. And, if a company has had a long list of managers and/or owners, it should make you wonder why. Last, but not least, make sure that the builder has local representation that can respond quickly to your service needs. Funerals, weddings and Christmas Eve Services can’t be delayed waiting for parts to arrive from half-way around the world. Instruments and builders must be superior in all three key areas to meet your artistic and organ investment goals.